I've been trying a lot of different flours from Pereg Naturals lately and the Buckwheat was definitely the one which was the least like I expected. I presumed it would be heavy, like the grain, but it was anything but. It was a smooth transition into a baking. 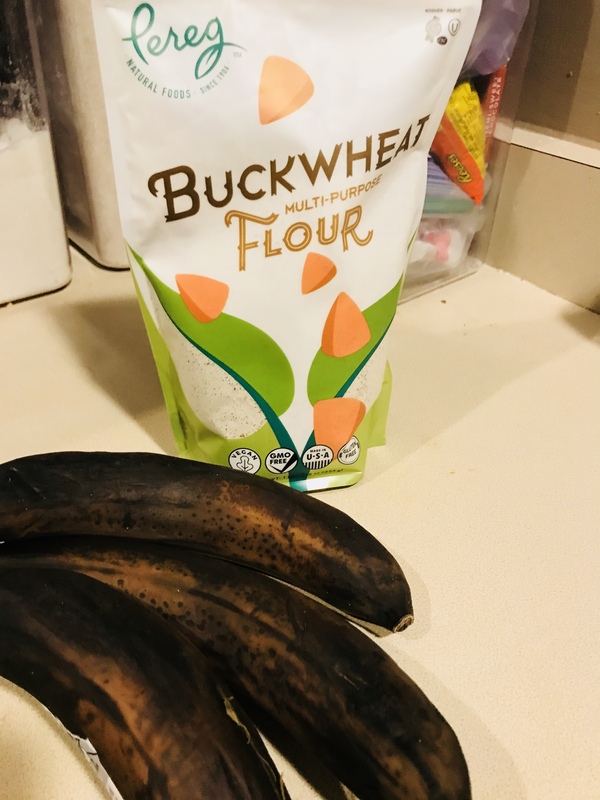 I originally decided to start with a buckwheat chocolate snack cake* recipe and alter it a bit because I was worried this flour would be dark and heavy. Instead, I got rave reviews from friends who had no idea it was a gluten-free buckwheat flour. *If you'd like to make this more cake like, bake it for 10 minutes less in a square pan. Cream butter with electric mixer. Add eggs, vanilla, and banana and beat until smooth. Pour into loaf pan with greased parchment paper. Top with more chips and walnuts, if desired. Bake for 40 minutes, or until toothpick in the middle comes out clean.